The aim of the Society is to encourage an appreciation of the Arts among its members and within the community. You do NOT need to know how to paint to join. The Society meets at the Boilerhouse, Jacksons Hill, Sunbury every Friday and Saturday between 10.00am and 3.00pm. 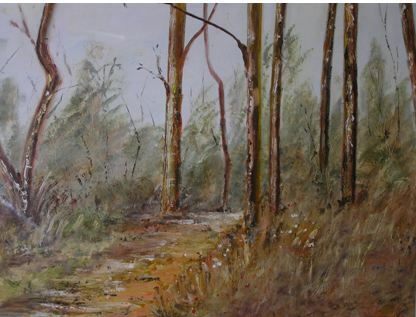 Saturdays members paint, swap ideas, attend a demonstration or workshop and generally enjoy companionship with people having a common interest. All members encouraged to make themselves available to take a turn at cooking the snags,roster at the Boilerhouse. Help raise some funds for your art society. 3. 2019 Trentham Easter Art Show. The Art Archive Blog - interesting articles for artists from around the globe. The Society has a general membership of approx. 70 members. All members are encouraged to contribute to the activities of the Society whether on a committee, assistance with organization of the Art shows, putting up road signs, contributing to preparation of the syllabus, running workshops or demonstrating painting techniques - there is something for every member to be involved in. The Society is always encouraging new membership. Prospective members are asked to attend for a number of weeks before making application to join in order to see how the Society is run and before they make any commitment. Membership is subject to nomination and approval by the committee. Building 20, Boilerhouse Art Gallery, Boilerhouse Road, Jacksons Hill, Sunbury, Victoria. P.O. Box 731, Sunbury 3429.